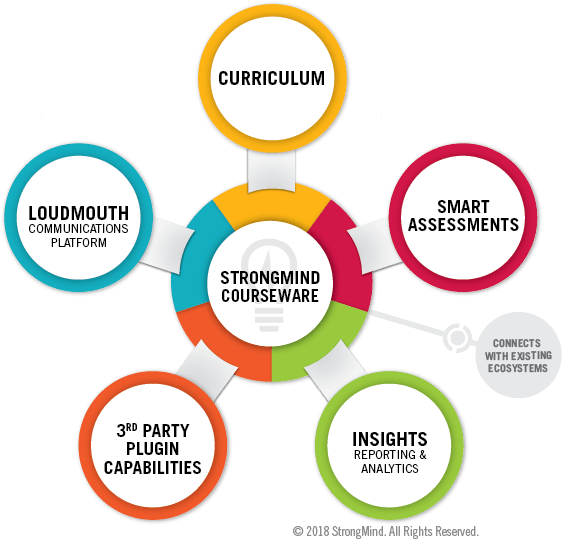 StrongMind’s next generation courseware encompasses award-winning digital curriculum, leading edge assessments, advanced reporting and analytics and a bi-directional communications portal. We invest a tremendous amount of resources to deliver superior content, design, functionality and analytics so you can provide an unparalleled learning experience for your students. StrongMind curriculum has earned 60+ awards including numerous Regional Emmy® Awards, Tellys, CODiEs, EdTech Digest Awards, and a Serious Play Competition Award! See our latest awards! StrongMind Courseware is designed to deliver a powerful and engaging learning experience for your students. Our course player is highly intuitive and remarkably simple to navigate. StrongMind is going beyond today’s requirements and setting a new standard in digital curriculum quality, efficacy and engagement. Galileo® K-12 Online assessments by ATI enable you to harness the power of data to provide a more personalized education and drive improved academic outcomes. The first bi-directional communications portal of its kind that allows your school to easily connect with parents and students and keep them informed in real time. Easily access the student data you need to make better decisions, solve problems and maximize academic success. You can employ StrongMind’s world class digital courseware as well as your favorite educational tools and applications from other providers.